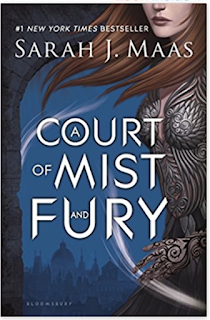 A Court of Mist and Fury is the second novel in Sarah J Maas Series "A court of". If you have not read this series yet, then let me tell you what it is about. It is a Series about Magical High fae people kind of like Lord of the Rings mix with a little Narnia. As I said first, this blog is about the Second book which is 624 pages long in Hardcover and will be available in Soft cover on May 2nd of 2017. 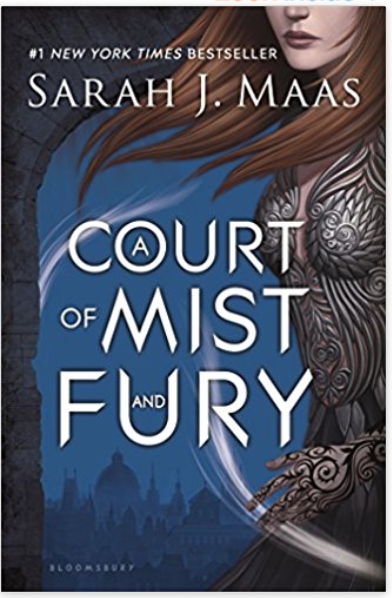 That is also the day that the third book comes out in this Series, which is title "A Court of Wings and Ruin". This book is available where ever books are sold and is so worth your time, which if you continue reading this review, you will see why? When I started to read this book, I did not think I would like it at all. Why did I feel this way? It is because of Rhysand, who is the Lord of the Court of Nightmares. Rhysand is basically the Lord of a night time, dream like world. He is consider the most dangerous High Fae Lord because he is also mix with another blood line called Illyrian. Illyrian seems to be a more old school barbaric bloodline then his High Fae magical blood. In the first book Rhysand has a habit of acting like, a complete alpha male fool. So when I found out he was the male lead in this book, I thought Oh heck no.. I felt like it would become a Jacob and Bella relationship, from twilight all over again. But, thankfully it turns out I was completely wrong. Rhysand is not only a great guy but he also ends up helping Feyre over and over again in this book. Which then leads to Feyre, finally believing that Rhysand is a great guy caught up in a big mess. So when Rhysand asks Feyre for her help, she does it without hesitation. But that doesn't mean that She doesn't question Rhysand the entire way. Eventually one thing leads to another which causes a more dangerous mess for Rhysand and Feyre.. Bet your wondering how they get out of the bigger more dangerous mess, ain't you? Well then what are you waiting for, go buy the book after you finish reading the rest of this blog. As for the Book, I absolutely love everything about it, so much so that I rated the book a 5 out of 5 stars. The cover on this Book is stunning, actually all of the covers for this series are Stunning. I love how fast pace this entire series seems to be when reading it. This world, just seems to open so easily as you read more chapters in each of the books. You come to understand why certain people are the way they are and why they have done what they have done. 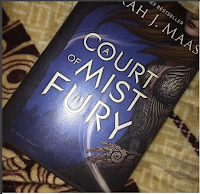 A Court of Series, is the first Series I ever read by Sarah J Maas, and it is so easy to see why Sarah is a writer. This world of Fae and magic just comes out so clearly and easily, while reading the books. If I am being honest, you won't believe how fast you will read these books. This series will probably be one of the fastest series you ever read. I also want to say I take back the fact that I said I don't think I would ever love Rhysand, because I am team Rhysand all the way now. I can't tell you enough about how much I love this entire series. It is extremely well written, it reminds me so much of Lord of the Rings. I also want to say because of how amazing this story is, I had a book hangover from the second book. I haven't wanted to read anything, because I am dying for the third book already. I honestly hope the third book is the final book because I do not know how I will survive waiting for another book. This story is just that kinda of story, you will read it, over and over again. It is as special as Harry Potter, Twilight or Hunger games. If you haven't read this series yet, I am telling you go buy all three books right now and read it, you will not regret it. As always all of the links for the author are down below.